School can be overwhelming enough for the majority of children, thanks to the sheer volume of academic responsibilities involved. When they’re also trying to think of what trajectory they want their future to take, school can become all the more stressful in an instant. This is why school counselors exist—to help students make the most of their time in school so they can prepare for their next step in life, whatever that may be. From ensuring students are taking the right classes in college to helping them find a course load that fits their academic abilities, school counselors have a large amount of responsibility on their hands. As such, prospective counselors must be able to prove they’re capable of the job. If you plan to work in the state of Oklahoma, this means taking and passing the OSAT School Counselor exam. This exam is designed to evaluate your comprehension of and competency with the various skills you’ll need to be a professional school counselor. If you don’t score well on this exam, you won’t be able to start off your career. The Mometrix Test Preparation team understands that this is an enormous amount of pressure. You want to do well, and we want to help you succeed. That’s why we want to offer you our OSAT School Counselor (039) practice test. 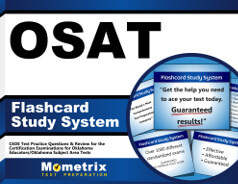 This study tool is one of the most comprehensive means of preparing for the OSAT School Counselor exam. It is designed to accurately mirror the full-fledged test, allowing you to familiarize yourself with the exam’s format and contents. 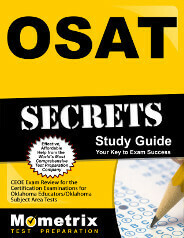 On the test, you’ll find a total of 81 OSAT School Counselor questions. One of them is an essay (or “constructed-response”) question. Taking up just 15 percent of the exam’s content, this portion of the test covers one topic alone: Counseling and Group Guidance. We hope this OSAT School Counselor practice test will fit well into your study plan. Remember that this resource is 100 percent free for you to use as much as you need. Good luck and happy studying!